Şükrü Saracoğlu Stadium is a purpose built football stadium located in Istanbul’s largest and most cosmopolitan district, Kadıköy. Dating back to 1908, the ground was last renovated in 1999 and is famous for hosting the last ever UEFA Cup Final in 2009. Şükrü Saracoğlu Stadium first opened in 1908, however the original stadium was vastly different to the one which was rebuilt at the turn of the millennium. Known as Papazın Çayırı(The field of the priest), it was the first such football ground of its kind in Turkey, and was used as the exclusive venue for every team of the Istanbul Football League including Galatasaray and Beşiktaş. Funded by donations from the participating clubs, the first stadium cost 3,000 Ottoman gold pounds, and was known as Union Club Field after İttihatspor made the biggest investment in the project. When the larger and more modern Taksim Stadium opened in 1922, İttihatspor sold the ground to the state who in turn immediately leased it back to Fenerbahçe. Fenerbahçe later purchased the stadium from the government on 27th May 1933, becoming the first team to own their own stadium in Turkey. 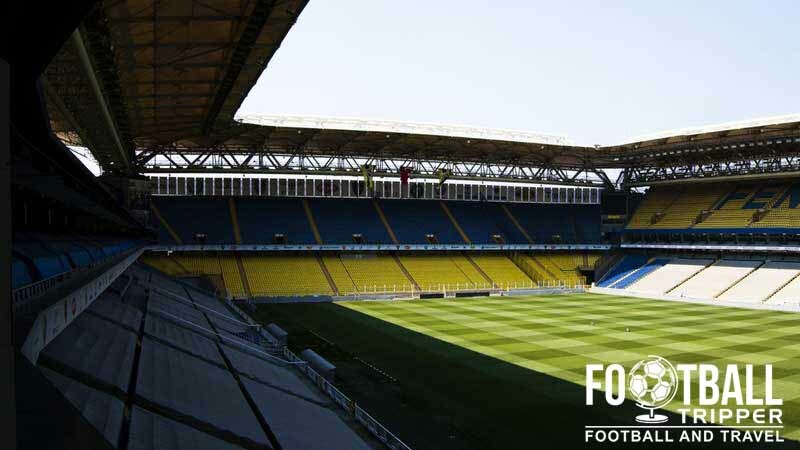 Forging a new identity, it was renamed to Fenerbahçe Stadium, and with a capacity of 25,000 it was the largest in the country. A member of the CHP Government, Şükrü Saracoğlu was instrumental in the development of Fenerbache in its formative years, and personally oversaw the sale. Therefore it was only fitting that the stadium would be renamed in honour of the club’s icon and Turkey’s 6th Prime Minister in 1998. 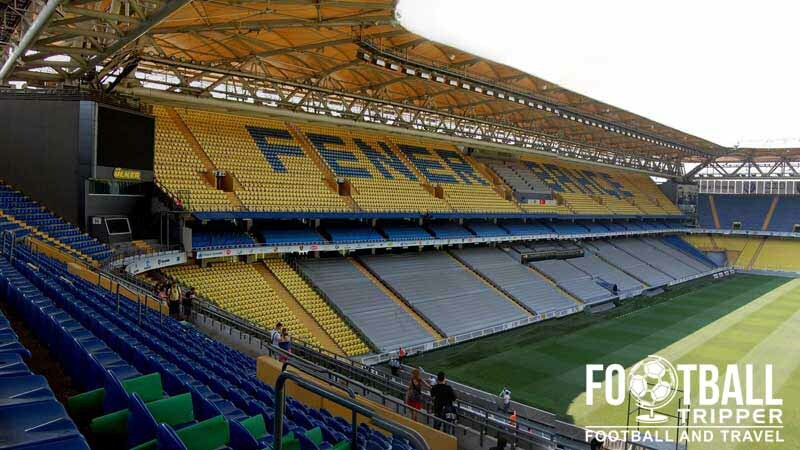 To coincide with this, it was announced that the entirety of Fenerbahçe’s stadium would be renovated with each stand demolished and rebuilt individual to avoid disruption. Costing $85 million dollars, the work was carried out between 1999-2006 , and resulted in an improved 50,509 capacity. On 20th May 2009 Şükrü Saracoğlu Stadium made its own piece of history by hosting the last ever UEFA Cup Final between Shakhtar Donetsk and Werder Bremen. The Competition was later rebranded as the Europa League, and Fenerbahce continue to regularly participate in both this, and the Champions League. Şükrü Saracoğlu Stadium is comprised of four stands: North, East, South and West. Away fans are tucked within the corner within sections GH (Upper) and OP (lower) with additional sections F and N opened up to travelling supporters providing there is enough demand for tickets. Home fans throughout the stadium chant for 90 minutes in order to create a hostile wall of sound that helps to give their team the edge, and one of the most intimidating away atmospheres in Europe! Official Fenerbahçe’ merchandise can be purchased from one of several mobile merchandising kiosks on matchdays. Known as “Fenerium Trucks”, several outlets throughout Turkey, and from the permanent Fenerium club shop, and online store. 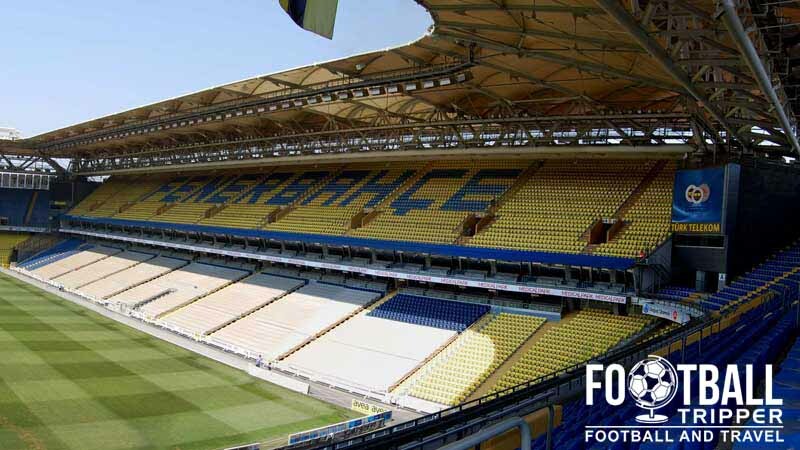 It doesn’t appear as if Fenerbahçe FK currently offer fans to undertake a tour of Şükrü Saracoğlu, however if this changes we’ll endeavour to update this section. There is reportedly a museum at the stadium, however we’ve heard mixed reports regarding its opening to the general public. Tickets to see Fenerbahçe play football can either be purchased online, from several Biletix outlets throughout Turkey, or at the stadium a few hours before kick-off assuming that the match hasn’t sold out. We’re currently unable to publish expected ticket prices due to it being the end of season. Şükrü Saracoğlu Stadyum is based within the Kadıköy district of Istanbul approximately 8.5km north of the historic city centre. 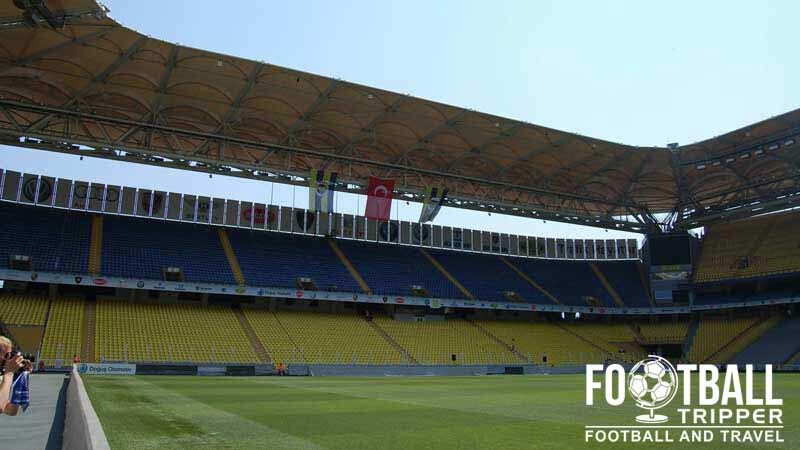 Fenerbahce’s stadium has occasioanlly hosted matches of Thr Turkish national team so perhaps its only fitting that the flag of Turkey is prominently displayed at the ground. The closest train stations are either Söğütlüçeşme (five minutes north) or Kızıltoprak (five minutes south). Services could previously be caught from Haydarpaşa Gari, however since June 2013 the station has effectively closed in anticipation of the new Marmaray commuter rail line. As Sükrü Saracoglu is located in the Asian side of Istanbul which is separated via the Golden Horn or Haliç waterway, fans have the option of catching a ferry across to the neighbourhood of Kadiköy. Departing from Sultanahmet on the European side, ferry depart every 20 minutes and take just under 15 minutes. The nearest metro station is Kadıköy however it is situated 2.2km west of the stadium, and will leave you with a 30 minute walk. Situated in a dense neighbourhood unfortunately there is very little on-site parking which means driving isn’t advisable. If you must drive then get there early and look at the two medium size car parks just north of Şükrü Saracoğlu either side of the railroad. Lots of yellow and blue jerseys around Şükrü Saracoğlu Stadium on matchdays. Istanbul Ataturk Airport is situated 25km west of the city centre is the closest international airport, and is where you will likely fly into. As Europe’s 4th Busiest airport you can be assured that there are decent ground transport links upon arriving such as the metro and numerous bus services. The closest hotels to Fenerbahçe’s stadium are all found west of the stadium back towards the metro station. Here you will find a DoubleTree by Hilton, as well as lesser known hotels such as the Parkhouse, Zirve, and Rihtim Hotels.